Is L&D doing enough to create truly effective learning? In the second article of this three-part series on digital learning realities in 2018, Director of Research at Fosway Group, David Perring, draws on new research conducted in partnership with Learning Technologies to see how digital transformation is impacting the effectiveness of learning. After over 15 years of talking about blended learning and over eight years of talking about 70:20:10 (yes, really), the support for making learning a continuous cycle continues to be weak. Whilst L&D departments have added numerous e-learning delivery technologies and wrestled with killing their LMS, they have completely under-delivered in empowering learners with solutions that support continuous learning at work. It seems that both solutions providers and corporates are complicit in failing learners. And perhaps it’s 70:20:10 thinking that is to blame. What’s the reality of digital L&D transformation? Is L&D doing enough to create effective learning? Copyright Fosway Group Limited. All rights reserved. The conclusions of our analysis are quite damning for those who claim to be digitally revolutionising their corporate learning. The reality is that the journey to having truly effective digital learning has only really just begun. But the truth is that the big challenge for L&D is not about forgetting curves at all! It is actually about supporting people in continuously improving and building their expertise and effectiveness. Learning is most valuable when it enables workers to build mastery and deliver business outcomes. If you think you are creating an engaging modern learning experience – then think again. 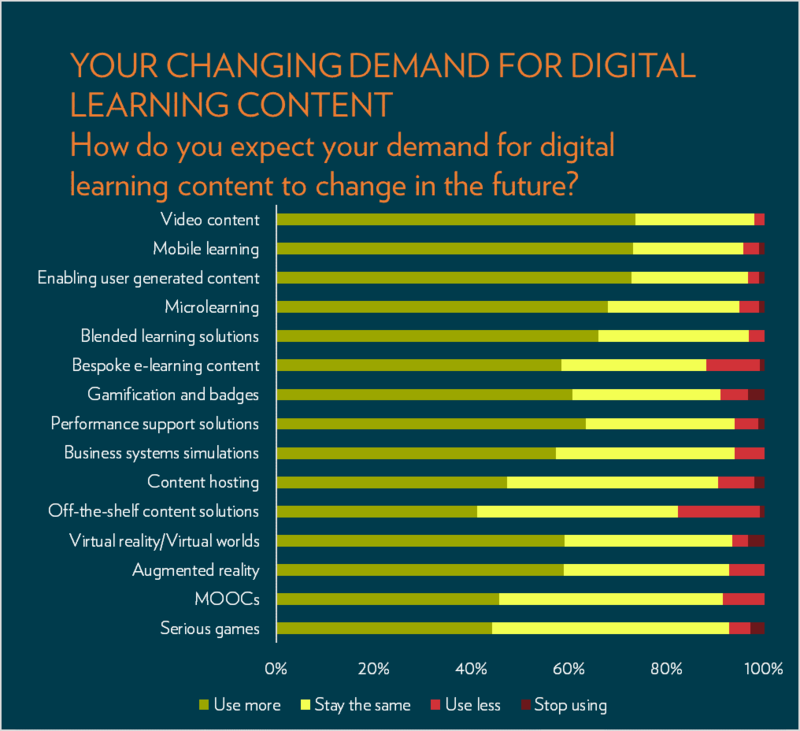 To that end our research shows that by focusing on learning content and content delivery rather than implementing powerful learning cycles, L&D has abandoned learners when they should be getting support the most! This issue is not the length of content but the learning experience itself. Ultimately, is not a content problem, but a problem of supporting performance development through purposeful practice. According to the Center for Creative Leadership 90% of L&D professionals expect managers to take responsibility for skill development after the learner has been trained. Unfortunately though, the Association for Talent Development found only 15% of leaders are satisfied that managers are effectively coaching and developing the skills of learners in the field. This issue is compounded by too many solutions providers failing to properly enable sustained and continuous learning. The learning technology experienced by too many organisations is the tale of the ‘Emperor’s New Clothes’… but too few are calling foul! Shockingly, this year’s research shows that less than 20% of organisations focus their L&D effort on tangible performance development. And despite 63% of organisations citing social learning platforms as a leading area of demand for their digital investment, the adoption of social learning still seems to be a myth. It’s rarely used as a purposeful part of the learning cycle. If you think you are creating an engaging modern learning experience – then think again. Most likely you and your suppliers are not engaging learners; despite all the rhetoric and UX (user experience) work performed by nearly all learning providers in an attempt to create a consumer grade user interface. In the trends for adoption there are some rays of hope. 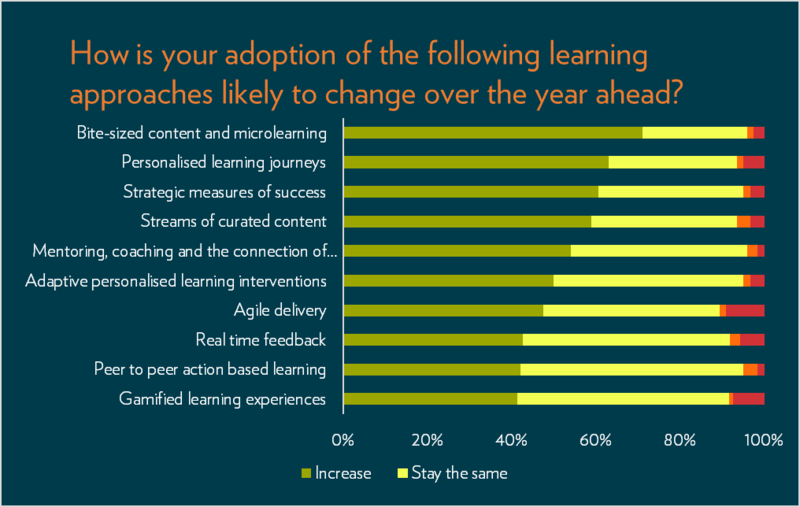 Things are shifting in the right direction with an increased focus on bite-sized learning and personalisation. But how much of that personalisation is embedded in ongoing learning experiences rather than providing one-off interventions remains to be seen. Interestingly, gamification continues to lag despite its ongoing popularity as a ‘hot topic’. Video and micro-learning emerge as the big focus for buyers this year. In fact, the diversity of learning delivery is evolving across the board. But beware. Despite the hype, short forms of content – or new delivery methods – are meaningless without a coherent, contextual learning and performance strategy behind them. L&D is at risk of trading one set of formats for a shorter version that makes the same fundamental mistakes. None of these approaches on their own address the performance agenda which we so desperately need to evolve. Even car mechanics reach for their diagnostics computers before they decide whether they are going to pick up a hammer, spanner or screw driver as the most appropriate tool. So why doesn’t L&D do the same? In many ways, we are at the edge of a massive change in corporate learning, but we need to think much more creatively about how we truly transform; rather than just giving a new look and feel to what are, in reality, failing models of delivering learning. L&D needs to tap into the strategic opportunities within its organisation to deliver against the goals of the business. My hope is that as we look ahead to 2025, we will see the emergence of AI and data-driven personalisation that will help move our learning solution forward. But even this is not enough. The world of learning is getting more complex and harder to execute than most realise and we must start to think more strategically about how we innovate and truly transform. I’ve said it before and I’ll say it again, L&D needs to tap into the strategic opportunities within its organisation to deliver against the goals of the business. And we’ll explore what those are in the third and final report in this series. You can download practical resources to help you in your digital transformation of learning and the latest 2018 Digital Realities Research here http://www.fosway.com/research/next-gen-learning/digital-learning-transformation/ and contact David Perring via @DavidPerring. David has been a learning professional for over 30 years. Over that time, he has always been at the fore-front of learning innovation and has retained a strong sense of optimism, energy and passion for transforming organisational learning and performance. Today, he holds a truly unique and privileged position. As Director of Research for Fosway Group, he independently explores the experiences of practitioners and suppliers to understand the realities of what’s happening in corporate learning, what’s inspiring change and what truly makes a difference. Much of his insight is drawn from the deep research he conducts for Fosway, but equally, if not more importantly, his expertise is rooted in his own practical and personal experience of continuously improving organisation’s adoption of learning and development solutions.